Every day as light hits your roof with photons (particles of sunlight), solar panels (PV Modules)  convert the photons into electrons of direct current ("DC") electricity. A solar inverter  converts this electricity from a variable Direct Current (DC) into a Utility Frequency Alternating Current (AC). That AC can be fed into an electrical grid (5) through Bi-directional Electricity meter (4) used by a local, off-grid electrical network (3). 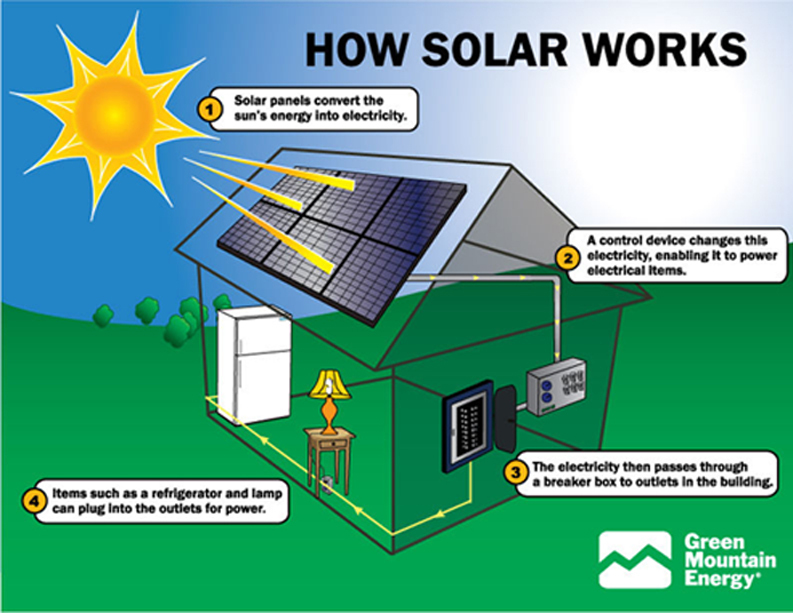 Any solar energy that is not used immediately goes back into the grid through Bidirectional Electricity meter . The Utility gives credit for the excess electricity received by it and deducts the credits earned from your monthly electricity bill. The photovoltaic modules, mounting systems, cables, solar inverters and other electrical accessories together constitute a photovoltaic power station, or rooftop PV system. Design By : Xposure Techmedia Pvt. Ltd .